On this stimulating episode of Talk it Over: Nancy Grace and the steel cage death match guest war, how to loose a friend in one easy insult, the married man who is still haunted by his ex-girlfriend. (It would be OK if she were a ghost, but she's still alive. 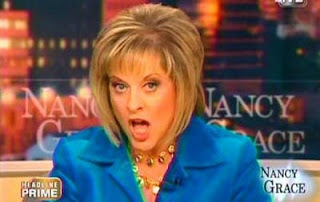 ), the band that's good... good and loud, and the restaurant that won't make up with the waitress who was fired for not wearing makeup..
Nancy Grace: Meaner, Angrier, Cut-his-mic-ier.